An obscure British sf masterwork? Gordon Holder is the narrator of No Man Friday . He is an engineer at Woomera, Australia, where Britain carried out its rocket and missile programme during the 1950s and 1960s. Determined to beat the Americans into space, the British engineers secretly build a rocket to take them to Mars. They sneak orders for the parts they need onto the account lines of officially-approved projects, and build the rocket inside a disused water tower. It’s a peculiarly British way to do it, working within the system, hiding in the bureaucracy – rather than fighting against it, one man versus the overbearing government, as would happen in an American novel. 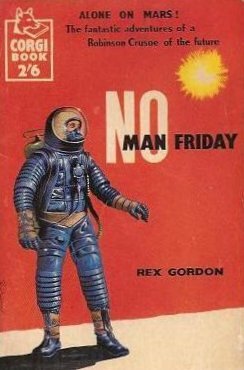 No Man Friday is not an especially scientifically accurate novel, although Gordon is careful to maintain a plausible tone. The rocket, for example, carries a crew of seven, and clearly owes more to the pointy rockets of the science fiction of the period than it does to the contemporary Redstone launch vehicle of NASA (one of which would put the first American, Alan Shepard, into space six years later). En route to Mars, Holder has to leave the confines of the rocket to fix a deflector-plate which is causing the craft to spin. On his return, something goes wrong and the outer and inner airlock doors are both opened. Everyone inside dies. Only Holder survives, because he’s still wearing his spacesuit. Gordon has clearly thought about what it would be like to wear an inflated spacesuit in a vacuum, and describes the difficulty of performing tasks in such a suit – although he didn’t anticipate the damage to fingernails that modern-day astronauts apparently experience on EVA (see here). The rocket crashes on Mars, but again Holder survives. Given that Gordon had no knowledge of the surface conditions of Mars – the first Mars lander would not be until 1971, when the Soviet Mars 3 managed to transmit data and pictures for 22 seconds; and the first successful landers were the US’s Viking 1 and Viking 2 in 1976 – nonetheless, he manages a reasonably believable Martian surface, not unlike, say, the Atacama Desert. Holder manages to use the wreckage of the rocket, and its surviving equipment, to manufacture both water and oxygen. He builds himself a sand scooter, and goes exploring. But wherever he goes, it’s all the same: an endless red desert, populated only by strange Martian cacti and the over-sized termites which feed on them. He even experiments with the plants, trying to find some method of preparation which will make them edible and nutritious. Then he discovers evidence of some larger animal – he has already guessed that the low gravity and air pressure would result in creatures larger in size than earthly ones. This creature proves to be humanoid in shape, but its behaviour demonstrates it is clearly not intelligent. But the giant centipede creatures, the size of buses, which feed on the corpses of the humanoids and communicate via biological light-organs, definitely appear to be. Fifteen years later, a US rocket lands on Mars, and its crew are astonished to see a human approaching their craft on foot. Holder has survived as a favoured pet of the giant centipedes. He explains this to the Americans, telling them that the Martians will only allow one rocket per year to land on the Red Planet. The Americans reply that the system is unworkable, not least because the Soviets are planning their own mission. Holder tries to return to the Martians, but is unable to do so – some strange barrier prevents him. No Man Friday clearly owes a lot to Daniel Defoe’s Robinson Crusoe and, in fact, references that book a number of times. Not having read Defoe, I can’t say how close the parallels are. No Man Friday is also a very explanatory book, as Holder takes an interest in his strange surroundings and in discovering how to survive in them. He explains what he does, and why. The prose is strong throughout, and Holder is an engaging and thoughtful narrator. The flora and fauna on Mars Gordon invents sounds mostly believable, and the giant centipede Martians are otherworldly enough to feel alien – especially given the hands-on engineering tone of the rest of the novel. No Man Friday is quick, fun and interesting, without being glib or ridiculously fanciful. It’s very much a “hard” science fiction novel of its time, but also very characteristically British. There’s no mistaking No Man Friday for an American sf novel. That’s where much of its charm lies. And, yes, it does belong on the British SF Masterwork list. Categories: book review, british, british sf masterwork, rex gordon, science fiction | Permalink. I’ll look out for it myself.